designated in 1982 These buildings are fine examples of the Art Deco style in the Bay Area. They were designed as an ensemble with the adjacent Berkeley High School Community Theater. Bas-reliefs and other surface decoration accentuate an architecture of simple geometric volumes. The block-long west facade is enlivened by alternating two-and three-story sections, repetitively patterned window groupings, and a subtle asymmetry. The facades are graced by a large bas-relief of the goddess Cybele and Jacques Schnier’s vibrant depiction of St. George and the Dragon. In a 1995 renovation designed by VBN Architects in association with WLC Architects, the buildings were structurally retrofitted and their interiors were entirely remodeled. Erected 2000 by Berkeley Historical Plaque Project. Martin Luther King Jr Way. Touch for map. Marker is at or near this postal address: 2201 Martin Luther King Jr Way, Berkeley CA 94703, United States of America. Touch for directions. Other nearby markers. At least 8 other markers are within walking distance of this marker. 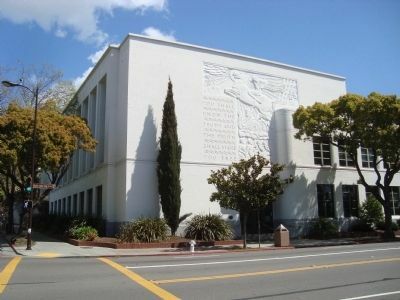 Berkeley City Hall (about 300 feet away, measured in a direct line); City Hall Annex (about 300 feet away); Berkeley Veterans Memorial Grove (about 500 feet away); Veterans Memorial Building (about 600 feet away); Federal Land Bank (about 600 feet away); Jos. H. McCourt / Bruno L. Putzker (about 700 feet away); Berkeley Y.M.C.A. (about 700 feet away); Framåt Lodge #405 (about 700 feet away). Touch for a list and map of all markers in Berkeley. More. 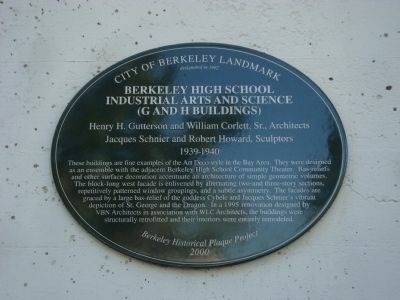 Search the internet for Berkeley High School Industrial Arts and Science (G and H Buildings). Credits. This page was last revised on July 26, 2018. This page originally submitted on April 8, 2012, by Barry Swackhamer of San Jose, California. This page has been viewed 580 times since then and 3 times this year. Photos: 1, 2. submitted on April 8, 2012, by Barry Swackhamer of San Jose, California. • Syd Whittle was the editor who published this page.